I have lived and worked in some of the world’s largest and greatest cities: Tokyo, Taipei, Chicago, Beijing, Singapore, Hong Kong, Buenos Aires, Mexico City, Rio de Janeiro. Each has something special…something that makes it different from any other city. London is no exception. In fact, it has a lot more going for it than some of those cities I just listed. First, there is the language. It’s English. No language barrier here. Well, there IS that East London dialect. Lor’ luv a duck! After a while I learned ter understand da chuffin’ East London varie’y ov English what some call “Cockney.” Know what I mean? OK, there is the weather. It can rain a lot. The skies can be grey and dull. But with the exception of the one day I took a tour to Stonehenge and the ancient Roman city of Bath, the weather was just fine. Not Southern California fine, but not bad at all. 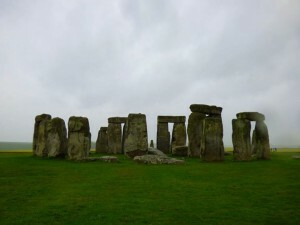 During the Stonehenge trip it poured. Once the bus arrived at Stonehenge and I hiked the few hundred yards up the road to those giant stones a strong wind propelled the rain horizontally. What better way, I thought, to see those silent, mysterious, 5,000-year-old megaliths than with gloomy weather fit for the windswept English moors or the ominous West Country landscape of the Hound of the Baskervilles? Had the sun been shining, Stonehenge would have lost its enigmatic and shadowy character. Bath was another story. I wish the sun had been shining in the town that dates to the Bronze Age and that was developed by Romans because of the natural hot springs that flow out of the ground. 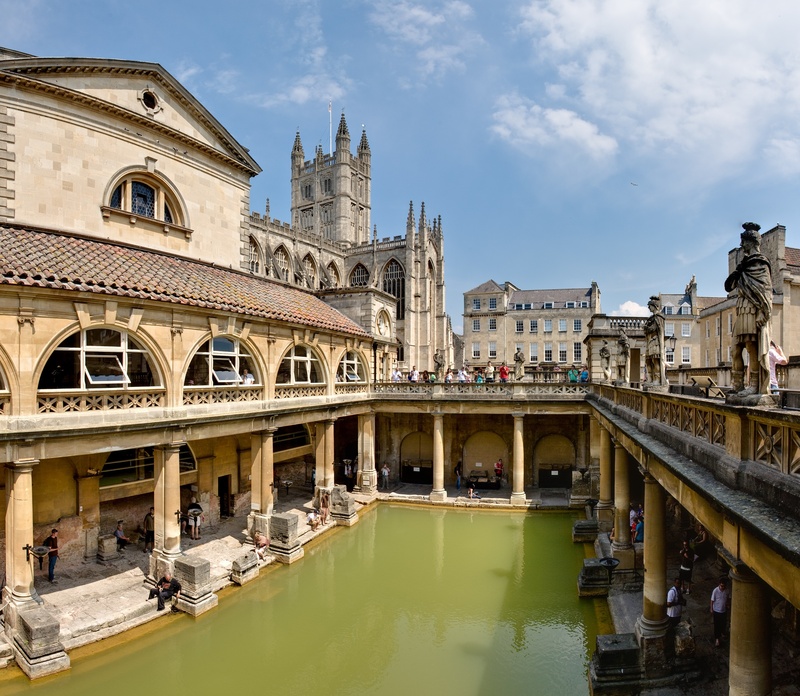 As the Romans often did, they built an amazing complex of baths above the springs called Aquae Sulis. There is the Great Bath, 1.6 meters deep and once covered by a high ceiling. Then there are the East baths, the circular bath and the West Baths, complete with heated rooms and pools for plunging. There is also the Laconium, a special room of intense dry heat where bathers received rubdowns with oil and a strigil. 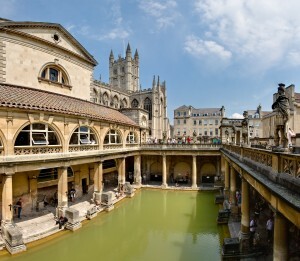 Sadly, the waters of the Roman baths are not safe for bathing because it flows through the still functioning lead pipes. Tests of the water show that a deadly amoeba lives in the water that can cause meningitis. Out of the Roman baths and back onto the wet streets it was under the umbrella again. Bath is the kind of town you want to stroll through–but not in a torrential downpour. As a result I never got to see the house that novelist Jane Austen lived in from 1801 to 1806 nor the huge Royal Crescent–the 230-year-old one-of-a-kind row of 30 terraced houses laid out in a sweeping crescent. Actually, even though Austen lived almost five years in Bath and set two of her novels in the town (Northanger Abbey & Persuasion), she never really liked the place. Maybe it is all that rain…. Back in London the weather was much better. The sun actually made several appearances as I toured the city via the “hop on-hop off” buses that ply the congested streets of London. 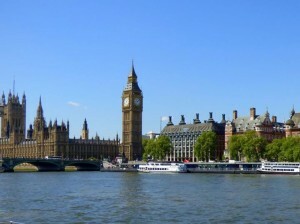 The “hop on-hop off” buses are the way to see London and get your bearings. 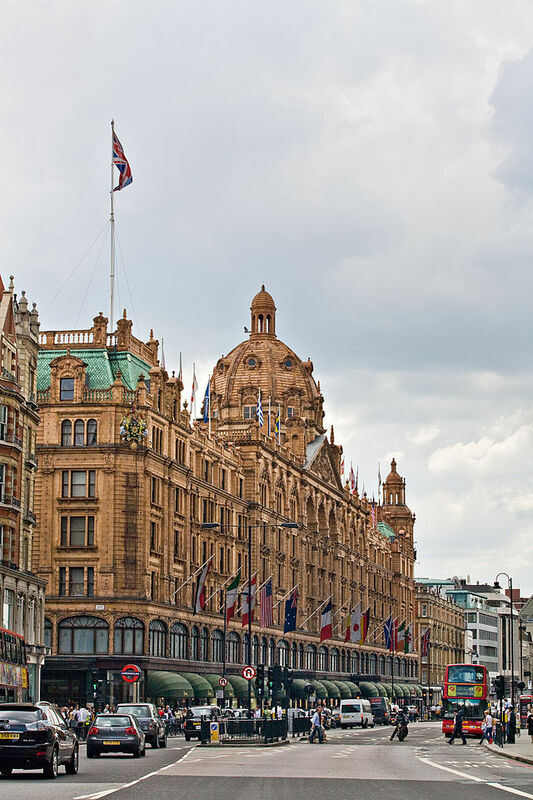 They will take you to places like Trafalgar Square and Piccadilly Circus, not to mention two world-famous department stores–the one million square foot Harrods and the 540,000 square foot Selfridges. Both of these establishments are worth visiting. I especially enjoyed Selfridges because for the past couple of years I have been watching “Mr. Selfridge,” a BBC/ITV production of the life of Wisconsin-born Harry Gordon Selfridge who opened Selfridges on London’s Oxford Street in 1909 and changed the way Londoners shopped forever. If you haven’t seen “Mr. Selfridge” I highly recommend it. 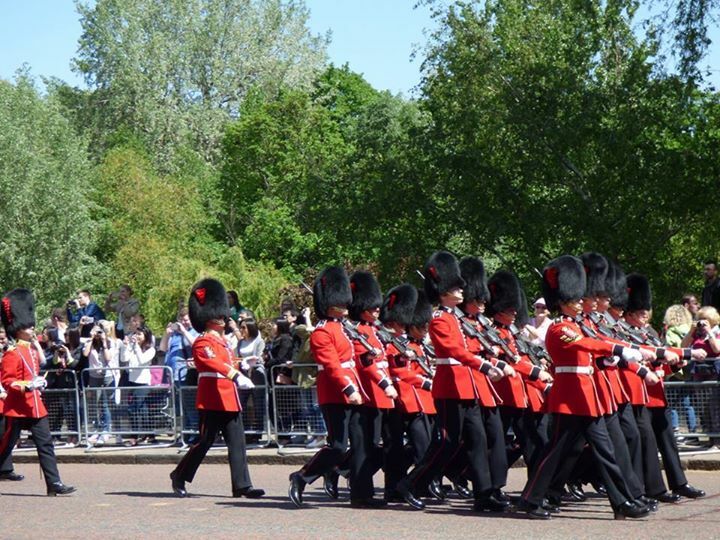 And if you haven’t yet been to London, I recommend that you go. It is a magnificent city with history that fairly oozes from every corner. While it is a large city with a population of some 8 million souls, it somehow doesn’t feel that way. It is a “walkable” city, with lots of unique “city centers” connected by a vast network of roads and streets. 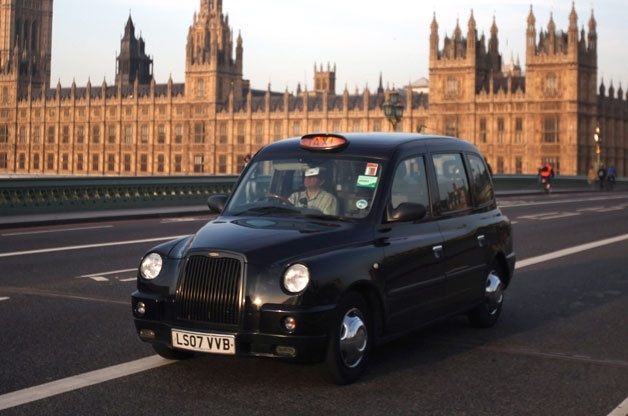 Finally, if you tire of the red double-decker city buses or those “hop on-hop off” conveyances, do yourself a favor and take one of London’s incredible taxis. They are great, with more legroom than you can imagine and drivers who really know their way around London. Did you understand that? If you did, you are already ahead of the game.